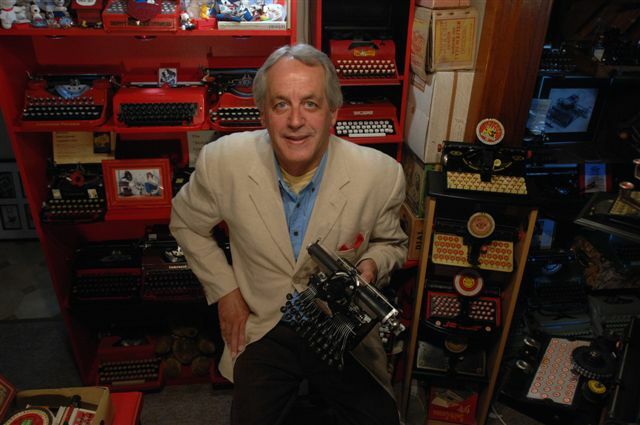 oz.Typewriter: 'Typewriter Tom' Thinks About Hanging Up His Typewriter Tools? 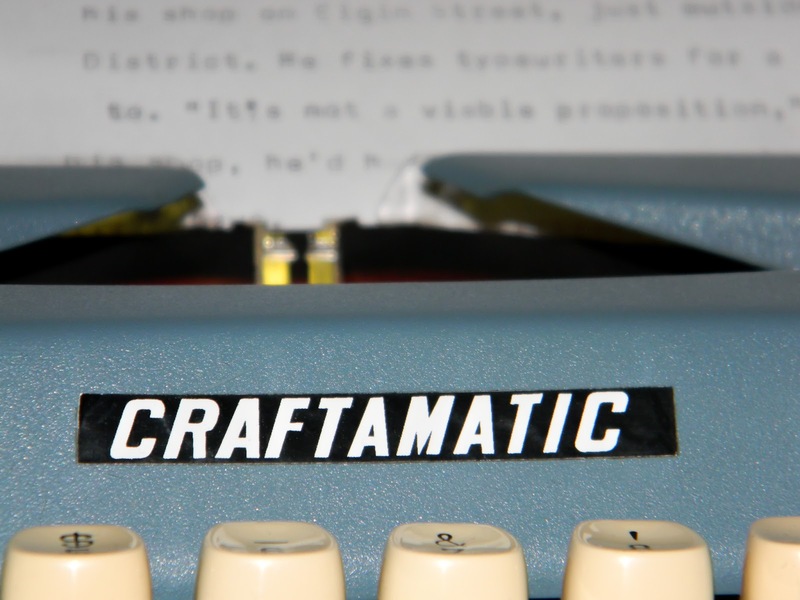 'Typewriter Tom' Thinks About Hanging Up His Typewriter Tools? "Typewriter Tom": Tom Koska repairing a Silver-Seiko portable at the "I Am Typewriter" Festival in Melbourne two years ago. Alarming news for Australian typewriter lovers appeared in the sub-heading of an article in an online magazine, The Magazine, earlier this month. 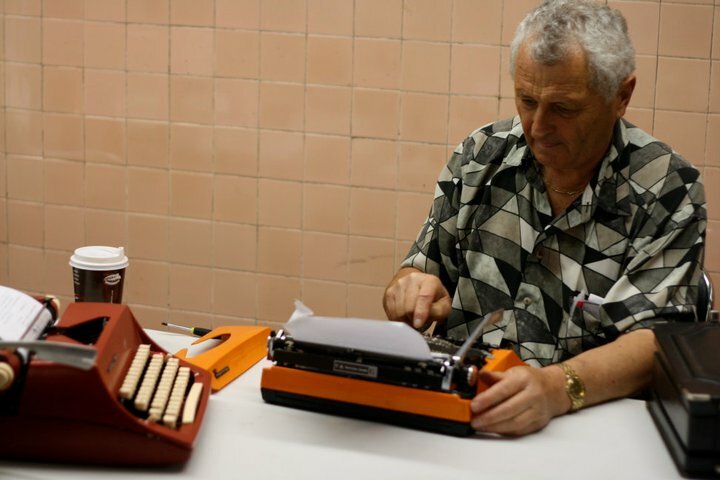 The line above a story by Richard Moss titled "Carriage Return" [Warning: Paywall] indicated Željko "Tom" Koska was, at the age of 70, contemplating retiring from his typewriter repair business at 188 Elgin Street in North Carlton, Melbourne. Elite Office Machines has been operating from Elgin Street for almost 45 years now. Happily, the article itself puts an entirely different slant on the situation: "But it’s [the typewriter business] all he knows, and he’s not about to quit." *The portable shown illustrating the magazine article, a Craftamatic, is a relabelled Bulgarian-made Maritsa 22. Maritsas were imported fully assembled into this country and relabelled by Currie Furniture Manufacturing Ltd (CFM). 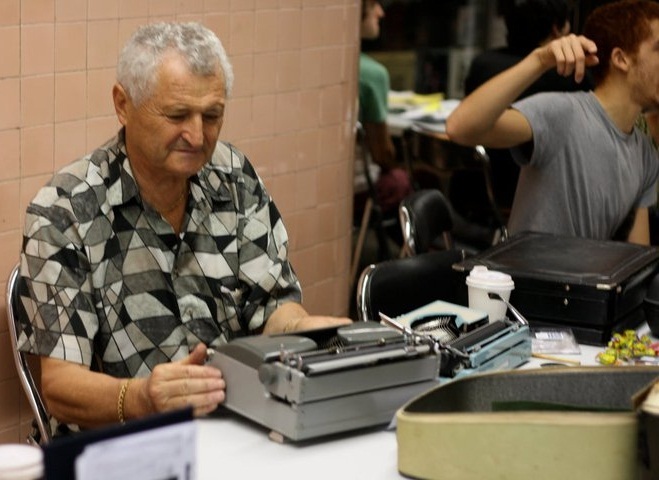 Known to Melburnians - and typewriter lovers throughout the rest of Australia - as simply "Typewriter Tom", Mr Koska has over the years endeared himself to a growing band of people who search the nation for reliable typewriter mechanics. His retirement would be a massive blow to the Down Under chapter of the Typewriter Insurgency. But it would seem that is NOT about the happen! 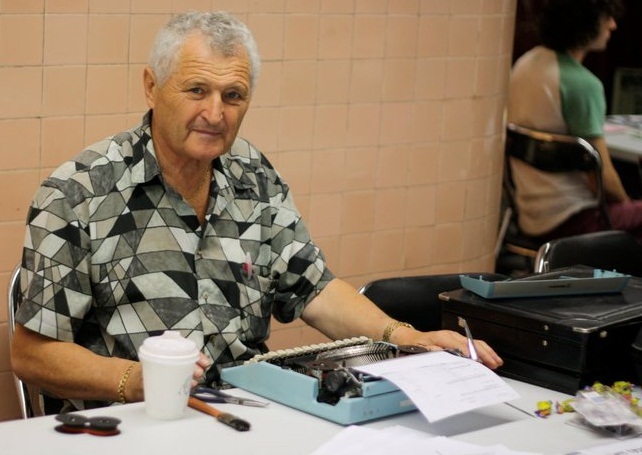 Serbian-born Tom arrived in Australia in 1966, after having learnt the typewriter repair trade in stints working in Germany, Austria and the former Yugoslavia. The Magazine's article sub-heading is, "A man who can repair almost any typewriter nears retirement." *John Lavery, Derrick Brown, Michael Klein and Peter Brill, of the ones I know, might have something to say about the author's claim on this, but for the time being we'll allow a little journalistic licence here. I hope John, Derrick, Michael and Peter will let it be, too. 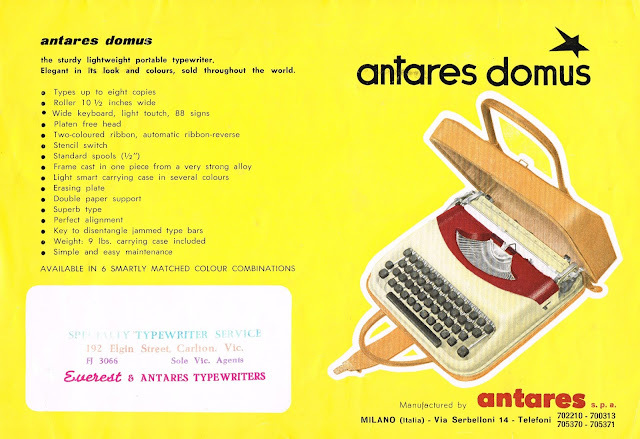 In the late 1960s and early 70s, Tom had the Victorian [Australian state] agency to sell Antares and Everest typewriters, as well as other European brands. 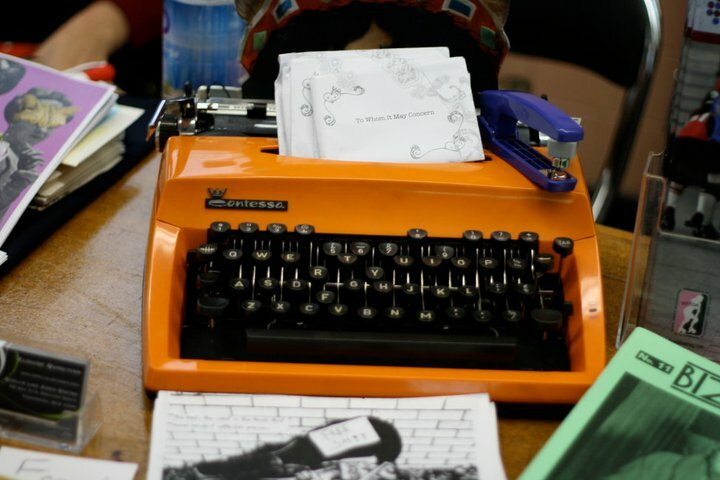 Among the machines he serviced during the 'I Am Typewriter' Festival in Melbourne was the red Consul semi-portable seen above, a machine with which he is also very familiar. Talking about the rapid rise in typewriter interest in Australia, Tom said, "The funny thing about the young people is they like these old black ones. You know, antique ones, but I only have a few left.” Moss writes, "It turns out that typewriters have made something of a resurgence in the past decade. It began in America, spurred by a perfect combination of nostalgia, retro-chic, technology fatigue, and, paradoxically, interconnectedness — it’s easier than ever to track down people with similar interests and to find old things on social networks and secondary markets. The recent popularity of television shows such as Mad Men only served to magnify the trend, pushing prices up and providing documentaries such as The Typewriter in the 21st Century an easy platform for media attention. "I couldn’t find a clear origin to this renewed interested in typewriters ... But I did spot a commonality among the burgeoning typewriter-blogging, or “typecasting,” scene ['a bizarre but very compelling take on conventional blogging. They mostly link to each other, too, in a kind of typewriter Web ring']. It’s a love for the focused nature of the machines, which stand apart from the chaos of modern computing ... A typewriter is the ultimate minimalist text editor, in a sense, and perhaps the real answer to technophiles seeking to unshackle themselves from the almighty bloat of modern word processors." "[Tom] only opens the shop by request, doing repairs on the spot. 'It’s not like they’re waiting in a queue,' he remarks. 'It used to be like four, five pages of typewriter repairers and resellers [in the telephone directory, I presume Tom means]. Now it’s only a few private people like myself.' He doesn’t dwell on this. At 70-years-old, he’s 'just about' retired. 'I do odd jobs, but that’s about it.' 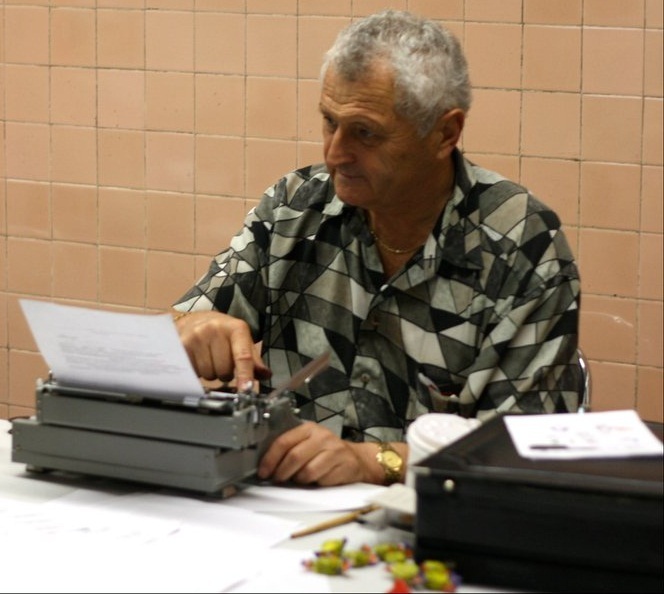 [But] 'fixing the typewriter gives me a pleasure.'" Tom's business number is listed as (03) 9347 6311. Tom working on a Torpedo Blue-Bird portable. A woman in black, right, is seen handing an early Remington portable to Tom (out of shot) at the "I Am Typewriter" Festival in Melbourne. It was here that I first met Tino ("The teeritz agenda"). Glad to see Tom does not want to quit repairing typewriters. 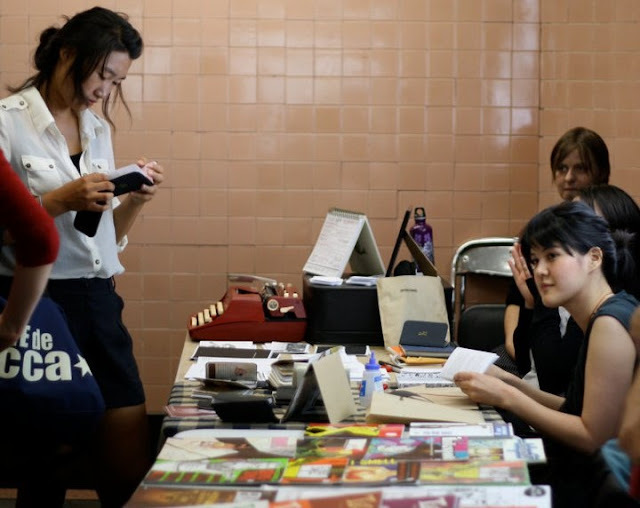 The typewriter festival looks like tons of fun. It's good to learn about Tom and to read this article with your help. Delighted to know that we are "bizarre but very compelling"! Tom has a facebook site now. But he needs more than 25 likes before he can get a unique facebook name/url. The shop is called on FB - Elite Office Machines - Tom's actual company.